Grapefruit likely originated in Barbados in 1750 as a result of natural cross-pollination between sweet orange and pomelo, another citrus fruit. Grapefruit seed extract, or GSE, is derived from the seeds, the pulp and the skin of the fruit and is usually found in liquid form. Due to its high content of phytochemicals -- types of antioxidants -- GSE possesses potent antioxidant, anti-inflammatory and antimicrobial properties that account for its wide-ranging benefits, from surface disinfectant and food preservative to healing aid for the immune system, skin, heart and other organs. Diabetes mellitus, or Type 2 diabetes, is characterized by elevated blood sugar levels and high blood lipid levels. Researchers who conducted animal studies to determine GSE's usefulness in the management of Type 2 diabetes found that GSE extract significantly lowered blood sugar levels and LDL or bad cholesterol and increased HDL or good cholesterol in diabetic rats. The researchers concluded that the results, published in the "Nigerian Quarterly Journal of Hospital Medicine" in 2008, might be due to the high content of the phytonutrients, such as flavonoids and cardiac glycoside, present in the extract. Researchers have long known that alcohol, as well as exposure to stress, can produce stomach damage. In an animal study published in the 2005 issue of the “World Journal of Gastroenterology,” GSE offered a significant protection against alcohol and stress-induced stomach lesions. GSE decreased the production of free radicals -- molecules known to cause tissue damage -- increased antioxidant levels and helped heal the damaged area faster. The researchers attributed these effects to the antioxidant activities of flavonoids, limonoids and naringenin found in GSE and suggested that GSE may offer the same protection against aspirin-induced damage and stomach ulcers. GSE possesses strong antimicrobial properties, which has led researchers to test its benefits in food preservation. In a study published in the 2014 issue of the “Journal of Food Science,” a GSE-treated beverage made with rice and wheat had reduced bacterial and yeast counts after eight weeks of storage, compared to a nontreated beverage. In another study, published in the 2009 issue of the “Journal of Food Science," pork loin samples that were infected with foodborne pathogens and treated with GSE had fewer pathogens after four days of storage, compared with the samples not treated with GSE. 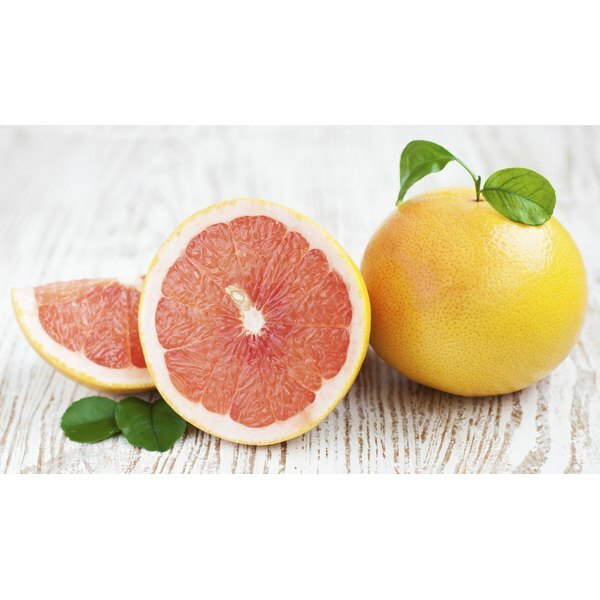 Grapefruit and grapefruit products interact with certain drugs, such as immunosuppressants, statins used to lower cholesterol, most calcium channel blockers taken for high blood pressure and benzodiazepines used to treat anxiety. GSE can either interfere with the proper elimination of a drug from the blood, leading to the drug’s increased concentration in the system and risk of adverse effects, or it can slow down the absorption of a drug, lessening its therapeutic effect. Consult your physician before taking GSE. The Encyclopedia of Healing Foods; Michael Murray, N.D., and Joseph Pizzorno, N.D.
Claudette Nazaryan is a nutrition consultant with an M.S. in nutrition and food science. She is also a certified alternative nutrition specialist. Nazaryan has experience in one-on-one nutrition counseling, developing dietary, nutritional and herbal supplement programs for various health conditions.